Peter Bright is an archetypical Aussie. Born in Sydney he graduated in oenology from Roseworthy Agricultural College in 1977 and began his wine-making life working for big names including Leo Buring of the Barossa and then Lindemans. By 1981 Peter had become one of the early tranche of Australian ‘flying winemakers’, coming to Portugal to work on various projects including establishing the João Pires brand. He went on to make wine all over the world, especially in Argentina where he was part of the spear-heading movement to transform the country from producer of bulk wines into bottler of premium varieties. Peter still works there, producing amongst other the ‘Elementos’ and ‘Piedra Luna’ ranges. Peter is now recognised as one of the world’s most experienced and gifted winemakers. But after 30 years of visiting and then living there, it is Portugal with which he is now most closely associated. “I love grapes and grape varieties, and Portugal is, of course an amazing place for varieties,” he told me, perhaps explaining a large part of the attraction. Today he is involved both as winemaker and business partner in a couple of projects. One of these bears his name in the shape of Fiuza & Bright, who are making some great wines in the Alentejo, especially the ultra-premium ‘Ikon’ range. These wines are not yet in the UK. Fermented and aged in oak, there’s a nuttiness about this and a little toasty char. On the palate a super creamy, opulent and modern wine, with masses of fruit sweetness that is fleshy and mouth-filling. The creamy, honeyed ripeness of the Chardonnay and the lemon and tiny herbal lift of the Fernão adding up to a full-flavoured, vivacious style with loads of lip-smacking tang and a long, nicely fresh finish. Commercial and lovely stuff. 88/100. 7,000 bottles of this Touriga were produced, aged eight months in oak barrels. Very smooth and welcoming on the nose, with a certain plushness and velvety quality, the deep, blackberry fruit, spice and a little hint of fresh herbs and flowers all melding beautifully with creamy oak. The palate too has delicious structure: it retains lovely freshness, always holding an edge on the firm but juicy black fruit and long, with the supple tannins and acidity nicely integrated, and that creamy, refined oak adding a layer of silky depth. 92/100. 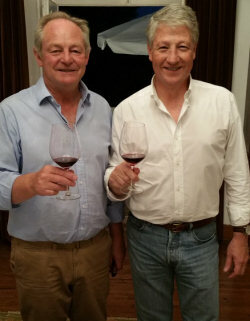 I met up with Peter over dinner in London, where we were joined by James Fleetwood, UK distributor of wines from his other project, Terras d’Alter. This was a great opportunity to taste through a number of the Terras d’Alter bottlings along with the striking modern cuisine of Nuno Mendes, Portuguese chef at Vijante restaurant (a review of which will follow on wine-pages). Sourcing fruit from across Alentejo, Terras d’Alter was formed in 2004 when Peter partnered two wine producing companies in the region. The range is made with predominantly indigenous grape varieties, “in a very modern way to produce really interesting, approachable wines,” according to James Fleetwood. Some joke that the Alentejo is Portugal’s ‘New World’ such is the relative youth of the region and the modern approach to winemaking. Terras d’Alter’s vineyard is structured with a new world approach (designed with the assistance of the University of Fresno, California) with modern training and irrigation in place. There are four ranges within the Terra d’Alter portfolio, priced from around £7.00 to £20 for the top, single vineyard wines. The Reserva Branco 2009 won the Portuguese White Trophy at the International Wine Challenge 2010, the first year the wines were introduced to the UK. Quality is very good throughout however, and whilst modern in design and character, there is also still a very good Portuguese signature to these wines that has not been lost: Peter may be an Australian whose wine-making worlds straddles the globe, but it is clear he has not only a deep love for Portugal, but a sensitive understanding of its wines. Distributed in the UK by Delibo Wine Agencies. Lea & Sandeman is a major retail stockist. Lovely aromatics here, pear and apple, with a touch of honeysuckle. There’s a trace of mint and of leafiness. From a strong limestone soil it has lovely chalky minerality and saline notes, with a burgeoning sense of ripeness, but scythed through by lemon zest acidity Thrilling and delicious. 89/100. Around £9. Viognier, Arinto and Gouveio. Wild fermented, 20% in new American oak barrels. From a very Austere granitic soils according to Peter. Delightful nose, with cool orchard fruits, a touch of preserved Moroccan lemon, and herbal notes. Just a touch of vanilla, but only a touch. The palate has terrific, decisive freshness, with a tangerine note, hint of apricot richness and lovely lime zest acidity shimmering on the finish. 91/100. Around £10. Quite a deep, purple-edged crimson and a big, earthy nose, with briar, cherry and a touch of liquorice. On the palate there’s a lovely creaminess to the flavour and texture. The acidity is good, with a little nip of tannin and dry, savoury finish. 87/100. Around £9. “A very peculiar variety” according to Peter, with small bunches and small berries, reminiscent of Pinot Noir or Nebbiolo, and which is very atypical for Portugal. Wild fermented in barrel. Lovely, gently spicy and smoky with pure, cherryish fruit and a delicate briar note. Delicious palate, bright, quite lean and deliciously soft black fruits, a seductive spiciness and firmly juicy finish, slicked with balsamic and liquorice notes and very long. 90/100. Around £9. This French varietal was established in the Alta Alentejo in the 1930s according to Peter. It has a fresh red liquorice bite, but mocha coffee and Agen prune and damson coming through giving this a seductive, deep and earthy character. Delicious palate too: grippy, edgy, confident stuff with a direct, juicy, bittersweet finish. 91/100. Around £9. Single vineyard wine, Peter tells me it was named after lots of fragments of terracotta tiles from a Roman villa found in the vineyard. 95% shiraz and Viognier, picked and vinified together. Aged in new oak, all American. Mint, espresso and very smoky and creamy character, with a ripe, creamy cassis aroma and the Viognier perhaps just adding a little peachy top note. The palate has plenty of fruit, but fabulous smokiness and swirling depth, fine tannins and very cool, crisp acidity that really freshens the finish. 94/100. Around £20.